Long-term Hi-Fi+ readers will know that Westone Laboratories, a Colorado Springs, Colorado-based firm, is a quiet giant in the world of hearing and music-related in-ear devices and technologies. With good reason the company’s slogan is, “Westone: The In-Ear Experts.” Unlike the many small ‘boutique’ firms common in the high-end audio industry, Westone is a large company with five distinct divisions focusing on custom ear-mould products; audiology supply products; digital, industrial, and personal hearing protection products; military earpieces; and—last but certainly not least, professional and personal music earphones. One key point to note is that each of these five divisions has developed specialised information databases and specific types of technical know-how that can be shared with any of the firm’s sibling divisions. If, for example, the custom earmould division learns something important and new about making custom earpieces for the hearing aid industry, that new knowledge is also available to help the earphone division make better music products. In short, there are deep and powerful synergies at work within Westone so that when new music products are created their designs are not purely the result of careful measurements and good musical intuition, but also are the result of a wealth of data on how human ears really work and on the requirements in-ear devices must meet. Many Westone products (musical and otherwise) draw upon the wealth of experience brought to the table by twin brothers Kris and Karl Cartwright, who together have helped develop more world-class earphones and CIEMs than any other two-person team in the industry. The general pattern is that Karl takes the lead role in designing new earphones and monitors, while Kris figures out the ways and means necessary to build them. Then, working together with members of an ad hoc expert listening panel, the brothers carefully verify the sonic capabilities of each new design before releasing it for full production. The latest product to go through this process is Westone’s new flagship universal-fit earphone: the Signature Series W80, which sells for £1,199.99 in the UK, or $1,499.99 in the US. 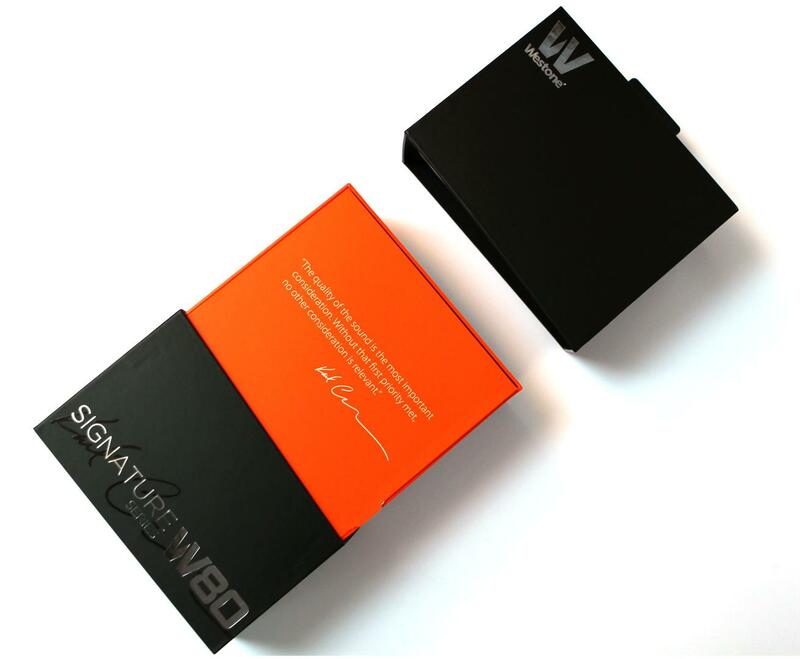 The Signature Series W80 is the first Westone model so labelled and for this reason principal designer Karl Cartwright’s signature is embossed on the outside of the box. Westone doesn’t launch new flagship products very often, so the W80 is a special model indeed and one the Cartwright brothers approached with all the care and commitment to excellence that a top-of-the-range effort demands. Naturally, a big question for Karl Cartwright was to ask how, if at all, the basic voicing of the W80 ought to differ from the baseline sound of the firm’s already excellent W60 earphone and its sibling ES60 CIEM model.